This open-source project establishes an automated voice to sign language translator for communication with the deaf using integrated open technologies. 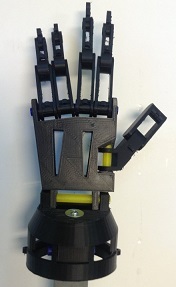 The prototype consists of a robotic hand -designed with OpenSCAD and manufactured with a low-cost 3D printer, which smoothly reproduces the alphabet of the sign language controlled by voice only. The core automation consists of an Arduino UNO controller used to activate a set of servo motors that follow instructions from a Raspberry Pi mini-computer having installed the speech recognition engine Julius. © ICTP Science Dissemination Unit, Trieste, Italy.